One of the most ambitious wetland restoration projects in the country is underway in San Francisco Bay. For more than a century, the South Bay shoreline has been home to industrial salt ponds. Now, thousands of acres of those ponds are being restored for shorebirds and wildlife. But that is creating an opportunity for a very problematic bird. The Bay Area’s gulls are well-known to San Francisco Giants fans. At one recent game, as the Giants staged a late comeback during the ninth inning hundreds of gulls appeared out of the night sky. Like clockwork, they show up just before the game ends. The attraction, of course, is the food. “It’s pizza. They’ve got garlic fries. They really love the garlic fries by the way,” he says. At the southern end of the bay near Alviso, a crew from the US Geological Survey is working on a small island in the middle of a former salt pond. It’s home to a colony of Forster’s terns. “Hey, what was the band number on that chick?” asks Garth Herring, one of the scientists on the project. The team measures and bands the small, speckled tern chicks. A few of them get radio transmitters. “When that transmitter is attached to a live chick, the transmitter beeps at a very specific rate,” says Herring. If the chick dies, the beep slows down. But you might wonder – why do they need to know if a chick is dead? “Just to the north of us roughly about a mile, there’s one of the largest California gull colonies. They’ll come in, grab the chick. And they get back to the gull colony and they regurgitate to their chicks,” he says. At which point the tern chick – and transmitter – is inside the gull – until it passes through, that is. That’s when Herring and his team go looking for it. “It’s pretty common that we find just a small pile of bones, the radio transmitter and the band that was associated with that Forster’s tern chick,” says Herring. Last year, 40 percent of the tern chicks they tagged were eaten by gulls. “It certainly does suggest that California gulls do have the potential to have a big impact on these breeding water birds here,” he says. California gulls didn’t always call San Francisco Bay home. In the 1980s, a small group began nesting on one of the salt ponds. Now, that population has exploded. “California gulls are one of the earliest nesting species and they’re also probably the most aggressive. So they show up first that they can easily take over an area,” says Strong. The South Bay Salt Pond Restoration Project has spent millions restoring pond habitat for Forster’s terns, American avocets and the threatened western snowy plover. But it’s a conservation Catch-22. As more habitat is restored for shorebirds, it also creates more habitat for gulls. And as former salt ponds are flooded during the restoration, the gulls are looking for new places to nest. “With 40,000 gulls, there’s not a lot of room for other birds,” says Strong. Strong says the Fish and Wildlife Service is writing a plan to manage the gulls. One option is killing the birds. But gulls can live up to 25 years and with an endless food source at landfills nearby, she says there’s only so much they could do. “If you’re talking about removing birds lethally, it’s just not feasible. They are a part of our landscape, like it or not,” she says. For now, they’re trying something else. “So up ahead there are some gulls doing some courtship behaviors on the levee which is definitely a bad sign,” says Caitlin Robinson-Nilsen of the San Francisco Bay Bird Observatory. She’s looking at a large flock of gulls on a salt pond near Fremont. So, Robinson-Nilsen’s job is to haze the gulls. She uses a whistle and walks down the levee. The gulls aren’t happy about it. Robinson-Nislen says they’re hazing gulls twice a day to keep them from nesting next to sensitive shorebirds. So far, it looks like it’s working. 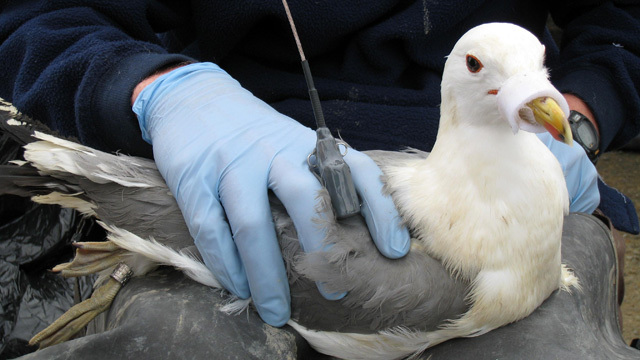 But with millions of tax dollars being spent on restoring more habitat, biologists expect they’ll be doing a lot more gull management in the years ahead. I suppose simply leaving the area alone to restore itself would be too much to ask. How many careers are being built on “restoring” these salt ponds? What are we talking, two decades, three, four? Do we really have to micromanage that restoration? Unless I am badly mistaken, those critters are “Forster’s Terns” not “Forester’s” as the transcription of the story says. Prev Meditation May Enhance the Strength of Neural Networks Next How Do Gulls Know When Giants Games are Ending?